15 student businesses, 50 judges, five winners, £5,000 worth of prize money and over 100 mince pies at CitySpark Christmas Marketplace. The first prize was awarded to Calm Creation, a mindfulness art box venture which encourages users to focus on their mind by drawing with music. 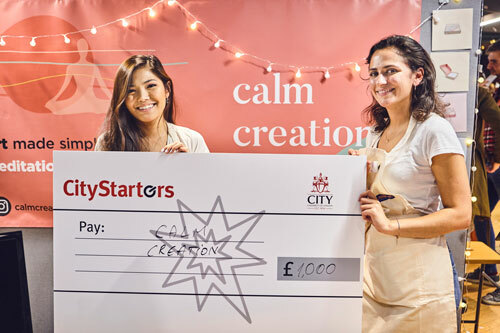 Tessa Etkin-Silver and Tata Arunyakanon, (MA, Entrepreneurship), the joint creators of Calm Creation, attended City Starters Weekend on opposite teams before realising they work well together and formed their mindfulness venture. Tessa said: “It felt like things were getting away from us when they were announcing all the winners, but thankfully they called our name and to win just feels amazing. “Everything we learn on our entrepreneurship course is directly applicable to creating our own business. We are encouraged to come up with innovative ideas and then challenged to actually pursue them. Tata said: “This business aims to help everyone who is experiencing stress or anxiety. This is more than just an art box, it is a tool which can be sent to schools, corporations and homes to help people take time for themselves. Runners up prizes went to Kancha Pisco-Bar, a cocktail business with Andean and Amazonian ingredients and Squado, a digital tool which allows employers to connect with their staff. The People’s Choice Award went to Entomo, a business focused on reducing over-farming by making edible insects and the Maker Spark Award went to Alien Security, a cyber security consultancy which identifies vulnerabilities which hackers could exploit. 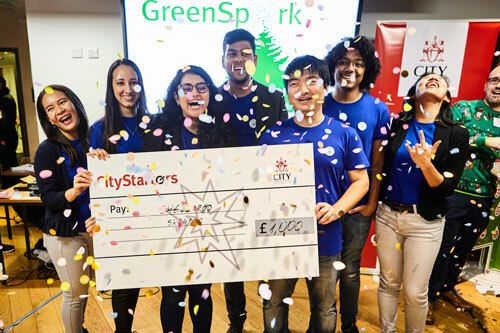 The Green Spark Award, which is sponsored by the Sustainability Team, went to the recent winners of City Starters Weekend, Shellpod Shampoo, a business which aims to create small balls that users can run underwater to create shampoo. Shellpod Shampoo creator, Umadevi Dassaye (BSc, Actuarial Science), said: “Winning the Green Spark Award recognises us as a business which wants to help the environment and reduce our carbon footprint – it is amazing to have that title as that is exactly what we want to do. “The team I met at the City Starters Weekend are all still with me now and although we all come from different backgrounds we all have the same passion and drive to achieve the best for the business. “Tonight we were able to use the pitching skills we learnt from City Starters to quickly articulate our business to potential customers.